We’re still in the height of the theatrical season with many productions opening during the next two weeks. To find reviews of all the current productions, click on the “Reviews” tab in white letters in the teal bar in the upper left-hand corner. Check out our calendar for everything including community theater and readings. 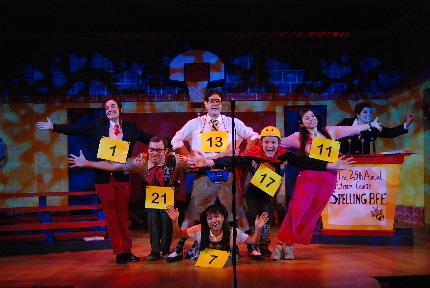 The 25th Annual Putnam County Spelling Bee musical explores in its charming, comical and stealthily touching way how we learn to cope with that truism when much of life seems a winner-take-all competition that most people are certain to “lose” — depending on your definition of that term. But each child – all played by young adults – is desperately seeking validation of their self-worth, as everyone in the audience once was or are still struggling with. Each reveals their backstory in a song or scene. Leaf Coneybear (Christian Vandepas) is the immature kid whose unfettered ebullience is infectious but whose family has told him that he’s dumb. Marcy Park (Jen Chia) is somewhat dour but a preternaturally overachiever tired of unrealistic expectations based on her being Asian. Chip (Rick Peña) is dealing with the pressure of being last year’s winner but is distracted by the first stirrings of puberty. Logainne Schwartzandgrubenierre (Jessica Brooke Sanford) is under intense pressure to excel from her two gay fathers. Olive Ostrovosky (Anne Chamberlain) is the sweet shy but bright girl with a vivid fantasy life whose estranged parents have emotionally abandoned her. And finally, there’s William Barfee — pronounced Bar-fay not Barf-ee (Mark Della Ventura) the socially-inept off-putting savant who spells out words with his foot before saying it aloud. Even the adults in the show are struggling with the past: Kaitlyn O’Neill is Miss Peretti, the bee’s organizer whose primary source of pride is having won the trophy herself 22 years ago; Matthew Korinko is Mr. Panch, the deadpan assistant principal/word caller who has just returned to the bee after an undisclosed “incident” five years earlier but who is “in a better place now,” and Kunya Rowley is Mitch, an intimidating ex-con assigned by a judge to community service at the bee as its “comfort counselor” (read: bouncer) to console the losers with a hug and a juice box.. If they all sound like archetypes — and they are meant to – this fine, fine cast, the show’s writers and director Patrick Fitzwater invest each with a vibrant individuality that prevents them from becoming two-dimensional. One by one, they are eliminated, and each learns their own specific way of dealing with disappointment and finding a way to go on with their lives. One of the joys of the show is that, in fact, each of them do. Another facet ratcheting up the merriment is that four audience members are chosen before the show to participate in the bee. While each does their best to the delight of their fellow patrons – some are embarrassed, most get into the spirit of it — it’s clear that each is doomed to be eliminated. A wry tongue-in-cheek humor pervades the script and score that are more ingeniously crafted than the casual observer might realize. While this sounds like a family show – and it can be, I guess – this is not a children’s musical. There’s some mild profanity and sexual overtones such as Chip succumbing to the first stirrings of adolescence in a song called “Erection.” Some of the humor might be accessible to all ages, but appreciating the drama requires a little more life experience than a pre-teen would have. One of the great pleasures having watched Slow Burn productions since the company bowed in 2010 is seeing its slow, sure growth. This is especially true of the cast, most of whom are members of Slow Burn’s unofficial repertory company of non-Equity actors. For instace, Chamberlain is nominated for a Carbonell Award this year for the title role in Slow Burn’s Carrie. Sanford and Vandepas were acclaimed just a few weeks ago for their work in Bonnie and Clyde. Slow Burn co-founder Korinko and Peña have been in almost every production. All of their gifts seem to expand and their skills deepen with each production. This is Slow Burn’s second production in its new partnership with the Broward Center for the Performing Arts. Slow Burn plans to mount two modest-in-scope shows in the Abdo New River Room, and next season will move its four mainstream productions from West Boca Community High School to the Broward Center’s Amaturo auditorium. Slow Burn’s Putnam may not be Hamlet, but it’s almost guaranteed to enchant. By the finale, you wanted to take each of the contestants home, or at least give them a hug and a juice box. 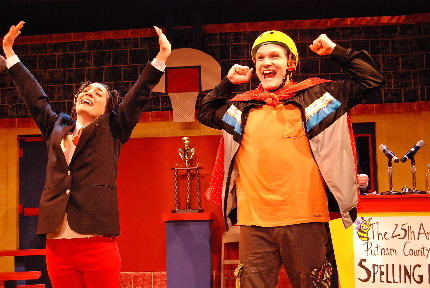 The 25th Annual Putnam County Spelling Bee presented by Slow Burn Theatre Company runs through April 19 in the Abdo New River Room at The Broward Center for the Performing Arts, 201 SW Fifth Ave., Fort Lauderdale. 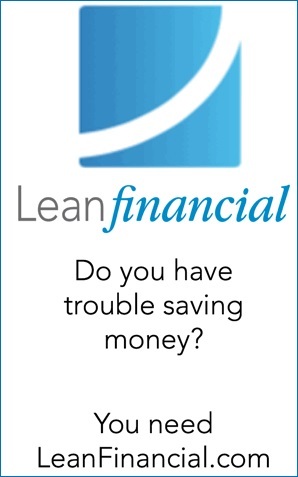 7:30 p.m. Thursday-Saturday, 3 p.m. Sunday. 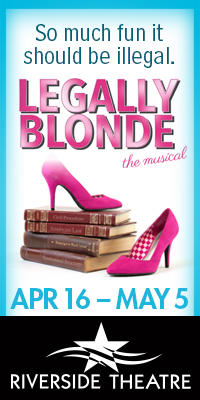 Tickets (954) 462-0222 or www.browardcenter.org. Runs 2 hours 5 minutes with one intermission. Table service for small plates and drinks begins 90 minutes prior to the performance. Tickets are $45 which does not include food, beverage or gratuity. 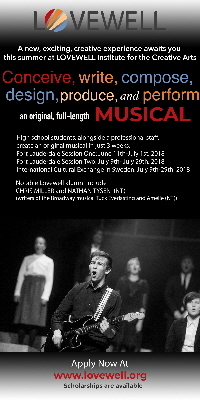 This entry was posted in Performances, Reviews and tagged Anne Chamberlain, Christian Vandepas, Jen Chia, Jessica Brooke Sanford, Kaitlyn O'Neill, Kunya Rowley, Manny Schvartzman, Mark Della Ventura, Matthew Korinko, Patrick Fitzwater, Rick Pena, William Finn. Bookmark the permalink.